2017 has finally brought an explosion of ‘Unlimited’ 4G plans available from US wireless carriers. Cordcutting (and saving money) is hugely popular, and people are sick of paying for 2 separate data connections. 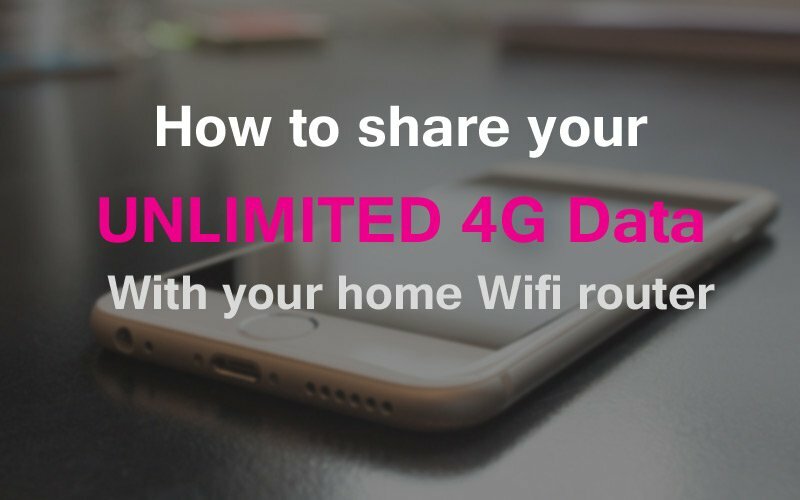 So can you use your 4G unlimited data for your home internet connection? The old method was to turn on your phone’s wifi hotspot feature, but that has really limited range and chews up your phones battery like crazy (not to mention shortening it’s lifespan if you do this daily). But now there’s a better way… (well 2 actually). Method #1: There are several routers that let you tether your phone directly to the router using a USB cable, which keeps your phone charged, and lets your router handle the heavy lifting. This method works only with your carrier’s ‘official’ tethering method (unless your phone is rooted or Nexus). 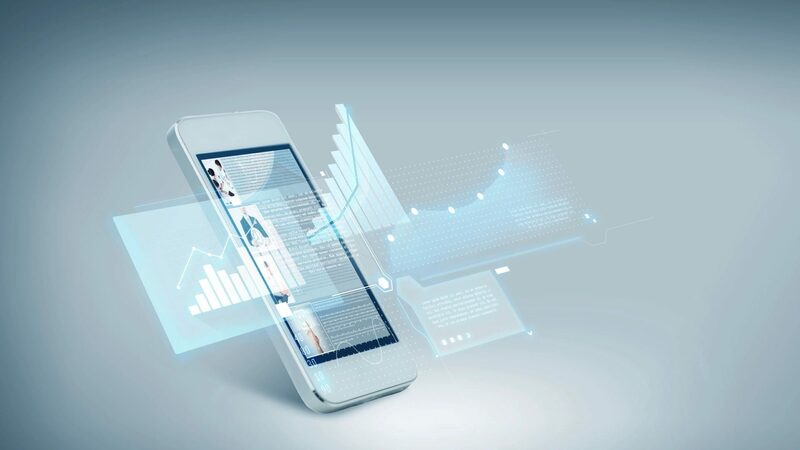 You can even connect the router directly to a VPN (and you’ll probably want to) to prevent your mobile company from throttling your non-mobile streams (yes they can tell). Method #2: For all other router types (or non-official tethering apps) you can tether your phone to your computer via USB and then ‘share’ your tethered connection to the Router via an ethernet cable. This method works with almost all routers, and is compatible with 3rd-party tethering apps (like PdaNet) the help users get around tethering data caps on unlimited plans. And this guide will show you how to do both. Cause we’re awesome. There are several reasons it’s WAY better to tether you phone directly to your router, instead of just using your phone’s wifi hotspot feature. 1. Range: The hotspot feature on your phone has limited range. You’re lucky if it can cover a big room at full speeds, and it certainly won’t cover an entire house. Good luck covering your basement theater setup and your upstairs laptop at the same time. 2. Flexibility/Routing ability: You really have no control over the ‘routing’ settings of a hotspot. With a true router you get access to powerful features like custom DNS settings, VPN protection, port forwarding, QOS bandwidth shaping, and more. The routers we’ll recommend even let you run a home cloud server, VPN server (for remote access to your network) or Bittorrent client right on your router. 3. Phone lifespan/battery: If you run your phone as a 4G hotspot every day, it’s highly unlikely it’ll survive a year. It’s just too demanding on the hardware. By contrast, if you tether it to a router via USB, the router does all the hard work, and keeps your phone charged at the same time. 4. Possible to get around hotspot data caps: Most ‘unlimited’ plans still cap the hotspot usage on your data plan. And the grandfathered really unlimited plans from Verizon don’t allow tethering at all unless you’re rooted. But there are several tricks to still use the official tethering feature on those plans. It’s also possible to tether using an app like PDAnet which doesn’t actually used your ‘hotspot’ data. We’ll cover that in a future tutorial. And every single ASUS router that runs their awesome ASUSWRT firmware is capable of tethering to your 3g/4g phone and sharing it’s data connection (android only). The only other firmware’s that support tethering are OpenWRT and DD-WRT. The problem? These aren’t stock (manufacturer-installed) firmware. You have to ‘root’ your router and flash the firmware yourself, which comes with the risk of ‘bricking’ your router (breaking the software so it won’t turn on or work properly). Pricing: ASUSWRT routers start around $80 and run in the the $300’s, so they aren’t cheap. But most people won’t need or want the true top-end line. Our absolute favorite ASUS router is the RT-AC68U, which currently costs around $150 on Amazon. It’s the perfect blend of affordability and power, and it’s one I use personally. We run a VPN server, VPN client, home cloud server, and have over 20 connected devices with no problems whatsoever. Important Note: This method works only for the native usb tethering option on Android phones. 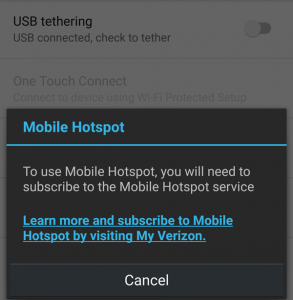 3rd-party tethering apps such as PDAnet, Foxfi, and EasyTether do not work with this method. Hot Tip: If your old-school unlimited plan doesn’t support native tethering, there’s a secret trick to activating it using the ‘signal refresher’ app. Instructions here. This method is confirmed working on OG unlimited plans from Verizon, T-mobile, and AT&T. Open your web browser and go to the local IP address of your router. By default this will usually this will be 192.168.1.1. If you’ve chained 2 or more routers together, your ASUS router might be on a different subnet, like 192.168.2.1. That’s the IP address to put in your web browser. 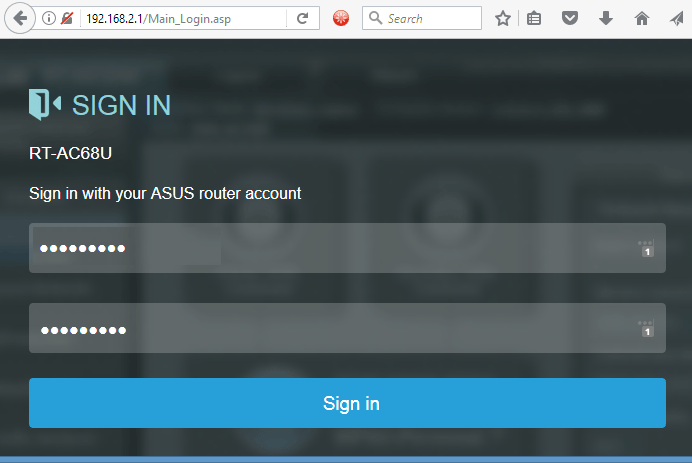 Then just sign into your ASUSWRT control panel you setup when you got the router. If you never changed the login/password then the default is admin/admin. On the left side of your control panel are the different settings sections. 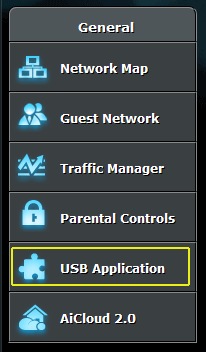 From under the ‘General’ section, click the USB Application button to be taken to those settings. Once the USB Application page loads, you’ll want to click the ‘3G/4G’ section to load the tethering settings. Use a USB data cable to connect your phone to a USB port on your router. 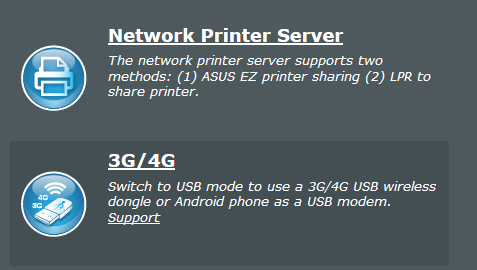 If your Asus router model has a USB 3.0 port you may want to choose that one as it likely receives more power. Ideally we want enough power that your phone battery wouldn’t drain, even with some screen-on time while connected to the router. On the RT-N66U we were able to charge the phone while tethering to a USB 2.0 port as long as the screen stayed off. 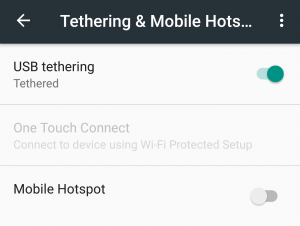 Depending on your phone model and Android version, the tethering options may be in a different place. We tested this tutorial on a Droid Turbo running Android 6.01. If your plan doesn’t include tethering, you’ll get the message shown below. In this case, either use this trick to enable USB tethering, or better yet just go with setup option #2, Foxfi/PdaNet, EasyTether. Once you activate the tether on your phone, it will take a little while for the router to recognize your active internet connection. ON the Network Map screen of the router settings, look to see if your WAN status shows ‘Connected’. If not, make sure that your WAN is set to use USB as the default WAN type. If you’re using a ‘Dual Wan’ setup, set one or the other to ‘USB’ and allow ‘Failback’ so it will keep retrying the USB connection periodically. If all else fails, restart reboot the router, which will sometimes help settings take effect. You may need to re-enable tethering on your phone after the router reboots. This step is incredibly important if you plan to use your tethered connection for HD video streaming, via Netflix, Youtube, or Hulu. Most mobile companies actually throttle 4G data (especially video) when it is routed to a non-mobile device. Here’s how… when you browse to Youtube or Netflix on your tethered PC, your browser passes identifying information with each data packet. Your 4G provider can see this header and knows which packets are going to a tethered device and which ones are going to a mobile device. And they will often throttle/slow the speeds of video streaming sites via tethered devices. Want proof? Tether your phone to your PC and then try to stream a 4k youtube video at full resolution (you have to manually change the resolution to 4k using the video settings tool in youtube). Guess what, you can’t. It will constantly rebuffer. Most mobile providers (we’ve personally tested T-mobile and Verizon) will deliver only around 480-720p video on tethered Youtube connections. But when you add a VPN, your 4G provider can’t read the packet headers or separate mobile from tethered traffic! On the same tethered connection, simply by connecting to a nearby VPN server (we used Private Internet Access for this test) we were able to instantly go from 720p max resolution to 4k max resolution on Youtube. Trust me, the difference is huge. If your plan doesn’t include ‘official’ tethering or you want to take advantage of your full unlimited data without tethering caps, then this is the method for you. It works with (almost) any router model. Note: You’ll need the pro/paid version of one of these apps to avoid time, data, or speed restrictions. With a one-time fee of around $8, PdaNet+ is well worth it. These tethering ‘workaround’ apps don’t use the official Android tethering support. Instead, they’re more like a USB file-transfer app that creates a ‘virtual’ internet connection on your computer and transfers the data back and forth between the phone app and computer app. You have to actually install software on your computer as well to make the tethering work. As a result, you can’t directly tether the phone to the router with this method. Instead, we’re going to tether the phone to your computer, and then share the computer’s tethered connection with the router (using an Ethernet cable for maximum speed). While this setup isn’t ideal in terms of mobility (your computer will need to stay near the router) it’s still better than nothing, and WAY better than an extra $50 internet bill every month. So if you frequently work at a desk, or have a desktop computer near your router, this method is perfect. An already working tethered connection: You should already be familiar with using your chosen app to create a tethered internet connection with your computer. A router (Midrange $60+): This method works with almost any router, though the actual settings menus might be different than those in our tutorial. We used the Asus RT-N66W for this tutorial, and we highly recommend ASUS routers for anybody serious about their home wifi network. Ethernet cable: You’ll need an extra ethernet cable to connect the LAN port of your tethered computer to the router’s WAN (internet) port. Second device: You’ll need another wifi-enabled device for testing purposes to make sure everything is working smoothly. Ideally this would be a computer or tablet with full web-browser access. Plug the ethernet cable into your PC’s ethernet/lan port and connect the other end to your router’s WAN port (where you’d usually plug in your cable modem). Disconnect your computer’s wifi. Open your chosen tethering app and start a USB tethering session with your computer. Make sure you have internet access and the tethering is working properly. If you’re on a windows machine, go to Control Panel > Network & Internet > Network Connections (you may also click on a link that says ‘change adapter settings’ and it will take you to the same place. 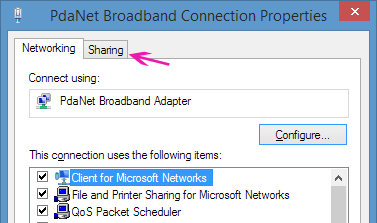 There are two ways to share your tethered internet connection to the LAN port. For some people both methods will work. For others, one or the other will work best. What can I say, Windows is an imperfect operating system. Click on 1 of the two connections you want to share (doesn’t matter which) then hold ‘CTRL’ while clicking the other connection to select them both simultaneously as shown in the image above. 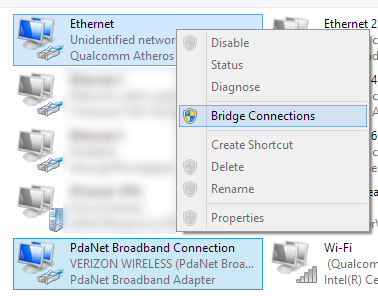 Then right click on either highlighted connection and choose ‘Bridge Connections’ from the popup menu. This will create a virtual link between these two network connections, which is effectively the same as sharing. It will take Windows a minute to create the bridge. That’s it. 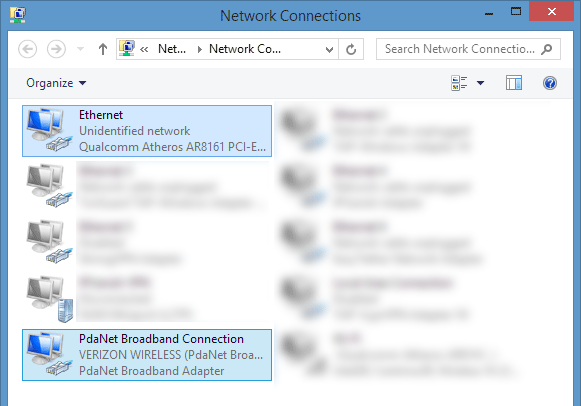 Windows will now show a ‘Network Bridge’ as a new connection in this control panel (you may have to hit ‘refresh’). You should now be sharing data directly from the tethered connection to the ethernet port. If the bridge doesn’t work or you have issues in later steps, try connection sharing. 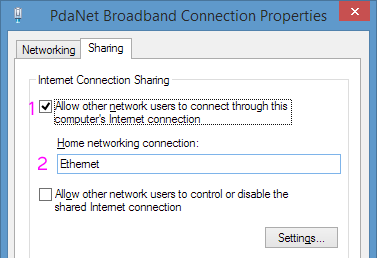 Right click on the tethered connection (in our example it’s ‘PdaNet Broadband Connection’). Then choose ‘…properties’ from the popup menu. Choose the name of your Ethernet adapter from the dropdown menu under ‘Home networking connection’. In our example it was ‘Ethernet’ but yours may be different. That’s it. You’re now sharing the tethered connection with your Ethernet port. The absolute easiest way to test your setup is to plug the other end of the Ethernet cable (the one that’s going into your routers WAN port) into another computer. If you can get online, the connection sharing is working perfectly. You can also verify it from within the control panel’s connection settings. Repeat for the Ethernet adapter. It should also say ‘Internet’ under the connection status. Important Troubleshooting Tip: If the Ethernet connection isn’t showing the correct status, try disabling your firewall temporarily. I literally spent 4 hours of frustration trying to figure out what was wrong. My antivirus/firewall was blocking the connection sharing without my knowledge. It’s highly recommended you validate the connection is working properly by connecting a 2nd PC to the LAN cable, as it will save alot of frustration later if the router can’t reach the internet and you’re not sure why. Plug the other end of the Ethernet cable back into the router’s WAN/internet port if it isn’t there already. Make sure your WAN type is set to WAN (not LAN, or USB, or whatever option you have). You may not have this option at all. We just want to make sure that your router knows that it should use the WAN port for internet connectivity and not some other port (like USB). Set your WAN type to WAN. This is ASUSWRT firmware, yours may look different. Your router may reset after this. If it doesn’t, you may still want to reboot it to make sure the settings take effect. Then go back into the router control panel and see if there’s a connection status indicator or a way to test for internet access. On ASUS routers, it’s right in the ‘Network Map’ panel. It will show you your router’s local WAN IP address, as well as a connection status. We want it to read ‘Connected’. If everything has gone according to plan so far, it’s time to test your setup. Go into your second (testing) device, and sign into the router’s wireless network. Can you access the internet? Yes: AWESOME! Everything is working perfectly and you now have a home network ready to use your 4G unlimited data. We recommend adding a VPN (discussed below) to ensure that you get full resolution video and no throttling. No: Doublecheck all the steps above, turn off your firewall, and try again. If it still doesn’t work, see the troubleshooting section at the end of this article. TLDR Bottom Line: Most unlimited 4G plans still throttle tethered data. Video streams will be low resolution and buffer frequently at 1080p or above. Use a VPN on your computer (or router) to block throttling and keep your video streams sharp and smooth. There are 3 different ways you can use a VPN. I’ll try to make the choices as clear as possible. Run the VPN on your router: If you have a router that supports this (mostly ASUS), this is a great option. It will route 100% of your devices connected to that router through the VPN tunnel. If you have an ASUS router, we have a complete guide for configuring OpenVPN on ASUSWRT. If you’ve flashed DD-WRT firmware onto your router, it is also VPN-capable. Use VPN software on individual devices: You can easily install VPN software on your PC, Mac, or Laptop computer (or even a tablet) that is connected to your tethered router. Many VPNs allow 3-5 simultaneous connections. This is the option most users choose. You can even install a VPN on your FireStick if you want! Run VPN app on tethered phone (Doesn’t work with Native Tethering): If you use a 3rd-party tethering app like Easytether or PDANet, you can use a VPN app on your phone and the shared connection will be routed through the VPN tunnel as well. This is almost as good as running a VPN on the router itself. Unfortunately this method doesn’t work with ‘native’ (official) tethering, which is routed outside the VPN app’s control. We previously reviewed the best Android VPN Apps. So here are my top recommendations. I have used all of these personally, and continue to use them on a regular basis. Private Internet Access ($3.33/month) – Simple, stable software. Good speeds. Zero logs. Cheap! IPVanish ($6.49/month) – Extremely fast speeds. Zero log policy, based in USA. VyprVPN – Fast speeds. Outstanding software. Standalone app for FireTV/Firestick(and all other major platforms). I’m not sure why, but this made my setup work when I was having trouble. 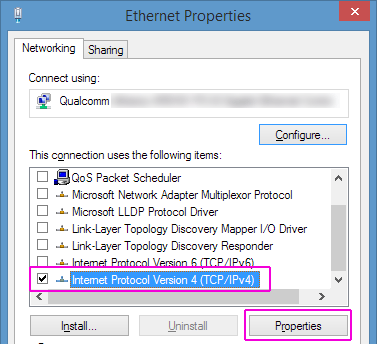 To set a static IP, go to the network adapter settings, right-click on the Ethernet adapter (the connection shared with the router) and choose ‘properties’ from the popup menu. make sure the IPv4 connection box has a check next to it. Currently your settings are probably set to ‘Automatic’ IP address. Change them to ‘static. Then enter a new IP address on a different ‘subnet’. The base local IP address is 192.168.1.1 so we recommend changing just the 3rd number block. You could make it 192.168.0.1 or 192.168.3.1 etc… just make sure it’s not an IP address already used by another router/gateway on your network. You’ll also need to manually specify the DNS servers the connection will use. 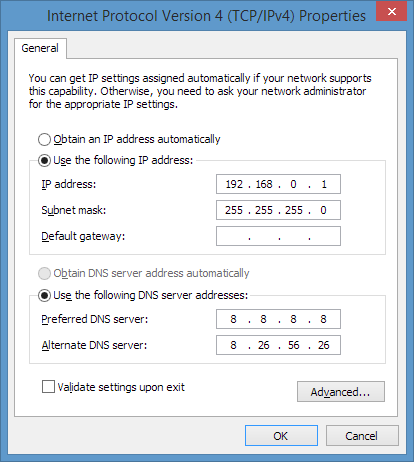 You can’t just type any IP address, you need the real IP location of real DNS servers on the internet. Hopefully that will fix things. You may need to reboot your router. Also make sure DHCP is turned ‘on’ on your router. Windows firewall probably wouldn’t block shared internet connections, but a third-party firewall like Mcaffee, Avast, Trendmicro, or Comodo might. Disable it temporarily and see if your setup magically starts working. This simple tip would have saved me hours of frustration. These are some articles/guides that I found helpful when trying to figure this process out for myself. Thanks so much for checking out this guide. Please let us know if it helped you. You can comment below, share it on facebook, or tweet us @vpnuniversity. I can honestly say this was one of the hardest/most time consuming tutorials we’ve done on this site. We hope you found it worthwhile. ⟵What to do now that WPA2 is KRACKable?